NEW YORK (CNS) — The day after a grand jury decided it would not indict a New York police officer in the chokehold death of Eric Garner on Staten Island, the New York City Commission of Religious Leaders asked that any protests arising from the matter be peaceful. “We all agree that these protests must remain peaceful, for the benefit of our communities, our children, and as an example to all who hold peace dear,” the Dec. 4 statement said. On July 17, a Staten Island police officer, Daniel Pantaleo, used what many describe as a chokehold on Garner, 44, who was unarmed. 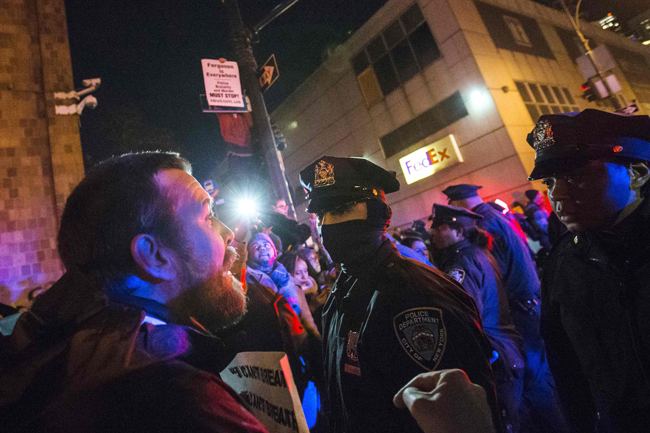 Chokeholds are banned by the New York Police Department; police officials said the officer used an approved move to restrain Garner. The episode was captured with a smartphone and later posted on YouTube. In the video, Garner can be heard saying repeatedly, “I can’t breathe.” A Staten Island grand jury did not indict Pantaleo for his actions in Garner’s death. 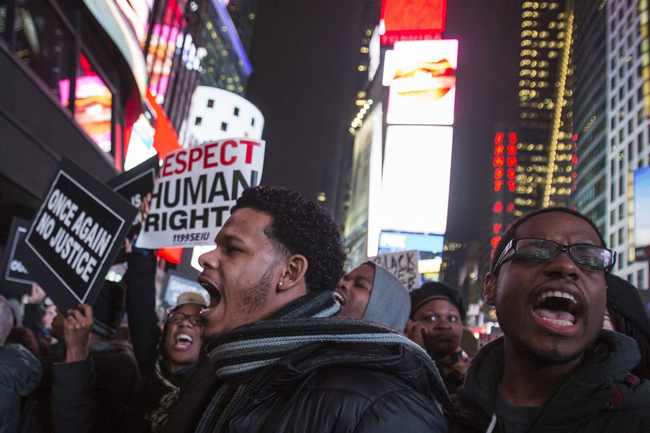 The Dec. 3 release of the grand jury report spawned protests in New York and elsewhere. The religious leaders’ statement did not comment directly on Garner’s death, the grand jury’s decision or the initial protests. “As we move forward we need to work to avoid destructive violence, build trust and create a more just city in which the dignity of each person as made in the image of God is respected and enhanced,” they said. An AP story cited police union officials and the officer’s lawyer as saying that Pantaleo used “a legal takedown move” because Garner was resisting arrest. Garner’s death was ruled a homicide and the medical examiner found that a chokehold contributed to it. Those protesting the grand jury’s decision argued race was a factor in Garner’s death because he was black and the officer is white. A majority of the signers of the religious group’s statement were Catholic clergy, including Cardinal Timothy M. Dolan of New York and Bishop Nicholas DiMarzio of Brooklyn. Others were Auxiliary Bishop John J. O’Hara of New York; Msgr. Kevin Sullivan, the archdiocese’s director of Catholic Charities; Father James Massa, chancellor of the Brooklyn Diocese; Jesuit Father Gregory Chisolm, pastor of St. Charles Borromeo Parish in New York City; and Father Carlos Rodriguez, administrator of Holy Cross Parish in New York City. Two rabbis also signed the statement, as did the president and executive director of the Council of Churches of the City of New York. Now there is an urgent need to “speak tenderly,” said Atlanta Archbishop Wilton D. Gregory in a Dec. 11 column in his archdiocesan newspaper, The Georgia Bulletin. “Speak tenderly to Jerusalem, and proclaim to her that her service is at an end, her guilt is expiated; indeed, she has received from the hand of the Lord double for all her sins,” he said quoting from a reading from the prophet Isaiah used at Mass Dec. 7. “We all listened to those words from the prophet Isaiah last Sunday, and their meaning must have been exceptionally poignant in their proclamation for those who heard them in Ferguson, Missouri; New York City; Cleveland, Ohio; and a number of other places throughout our nation where people have been stunned, disappointed and confused by the recent events that have claimed the lives of young black men,” he wrote. “The conversations that must now follow those painful events, which have managed to demonize victims, protesters and public officials, need Isaiah’s prophetic voice as perhaps never before,” the archbishop said. “We must tone down the rhetoric that inflames as much as or more so than it enlightens. 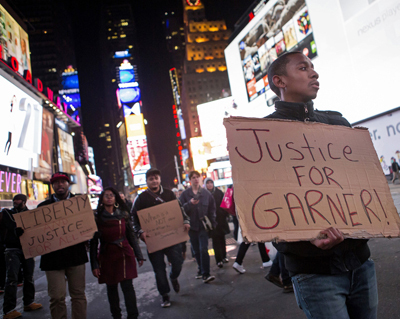 Serene Jones, president of Union Theological Seminary in New York, said the ecumenical Christian seminary’s community reacted with sadness and anger after learning there would be no indictment in the Garner death. The NAACP Legal Defense & Educational Fund denounced the lack of an indictment in the case. The Staten Island grand jury decision followed by one week a St. Louis grand jury that did not issue any indictments in the police shooting of a unarmed African-American 18-year-old, Michael Brown, in Ferguson, Missouri. The lack of an indictment caused that city to erupt once more in violence, with businesses looted and set afire, and protesters arrested and injured by police. Protests have continued to take place around the country. In Washington Dec. 11 a group called the Congressional Black Associates organized a demonstration at the Capitol on the House steps. The group included three members of Congress, congressional staffers and others who gathered silently and raised their hands in the air to protest the killing of unarmed black men by police.